This wonderful resin is wild-harvested by hand by our friend and artisan distiller who distills our Engelmann Spruce, Ponderosa Pinecone, Sage and Rabbit Brush essential oils. This is a traditional and sacred incense from the Southwestern US. These large pieces of Pinon Pine resin resonate a beautiful warm and fresh sweet pine fragrance when burned on a charcoal. The qualities that this resin bring are peace and balance. It clears negative energy from one's aura & environment. It is great for energetic protection, mental protection and strength. This locally and ecologically harvested resin comes from the native Pinon Pine trees that are native to our area. 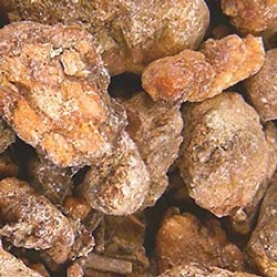 Many people are familiar with the pinon pine nuts, but burning this resin is another way to feel connected to the beauty of nature and the Pinon Pine trees! How to Burn Resins: Light the charcoal with matches or lighter for about 20 seconds until it self-ignites. Use tongs to hold it up (never hold it with your fingers alone or you might get burned). Place the lit charcoal in a bowl or any incense burner. The bowl or incense burner should be filled with sand or dirt. Let the charcoal warm for a few minutes. (It turns gray around the edges when it is ready) Now you are ready! Add a small amount of resin on top of the charcoal. The resin will burn and soon release essential, aromatic oils through the smoke. Continue to place resins or powder on charcoal as they burn out and smoke decreases for a continuous burning.